The directive by Uhuru Kenyatta that all top procurement officers should undergo fresh vetting process was hijacked by powerful forces at the Treasury who used the exercise to mint millions from the affected officers eager to escape the dragnet. The panel that was undertaking the exercise is said to have done a shoddy job that is yet to be known by members of the public. The final report has up to date remained a top secret with allegations swirling around that The National Treasury officials are sitting on it to avoid public scrutiny and bring out those involved. Those who did not go through due vetting according to our source include Richard Cheruiyot who was based at PPD in Treasury but now will be the head of supplies at the State Department of Livestock. James Kairu who initially was at Murang’a county before coming to the Treasury will now be the head at the State Department of Youth Affairs. He also did not go through the vetting test, according to close sources. Joel Ngomelong who was based at Youth Department was unprocedurally posted to the Department of Correctional Services. He is said to have moved two grades up to land the post. Beatrice Wanderi who was based at the Treasury as a junior procurement officer was promoted to head supplies at the ICT Authority. Andrew Otieno will now head state department of Vocational and Technical Training. He was previously based at the Treasury. He also did not go through due vetting process as directed by the law. John Maina was posted to the state department of Labour from the State Law Office where he was a junior officer without going through interviews, according to another source. Another beneficiary of the saga was Lydia Muronji who was initially at the OP. She will now be in charge of Education ministry. She boasts to be close to top senior people at Harambee House where the OP offices are based. Dickson Abdalla who was based at Livestock department now heads to the ministry of Health. Kennedy Obare who also did not go through vetting will be in charge at the state department of Broadcasting. Mike Kisero moves from a junior post at State Department of Mining to be in charge of affairs at the department of Immigration. Elizabeth Masaku who had integrity issues at the ministry of Health now moves to state department of Forestry while Kerich Chepkemoi who was at Environment ministry has been posted to ministry of Petroleum. His elevation was brokered by key Kalenjin businessmen eyeing beneficial petroleum tenders. He replaced Samuel Mativo who used his money to buy off the panel that was vetting him. Mativo now heads to the ministry of Trade. Felistar Njoki who also did not go through vetting will be based at the ministry of Energy. Benignas Luyera moves from Treasury to head post training department. Charles Mulandi who was at the state department of public service was posted to the ministry of East African community under unclear circumstances. He too did not go through vetting process. 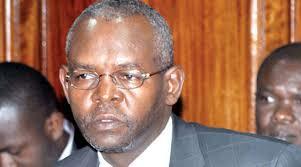 Peter Mulavu who was also not vetted was promoted to head supplies department at the Treasury. A one Momanyi who retired recently blames Mulavu for having been behind his woes. He is said to be close to the PS Thugge and CS Henry Rotich. Mulavu has remained untouchable since he was posted to the Treasury back in 2016. He has survived two transfers due to his connections with the powers that be at the Treasury where he exhibits terror on junior staff. The move to vet the officers according to a source backfired when the panel was compromised by the officers intending to retain their positions with others using the opportunity to do away with those they did not like.